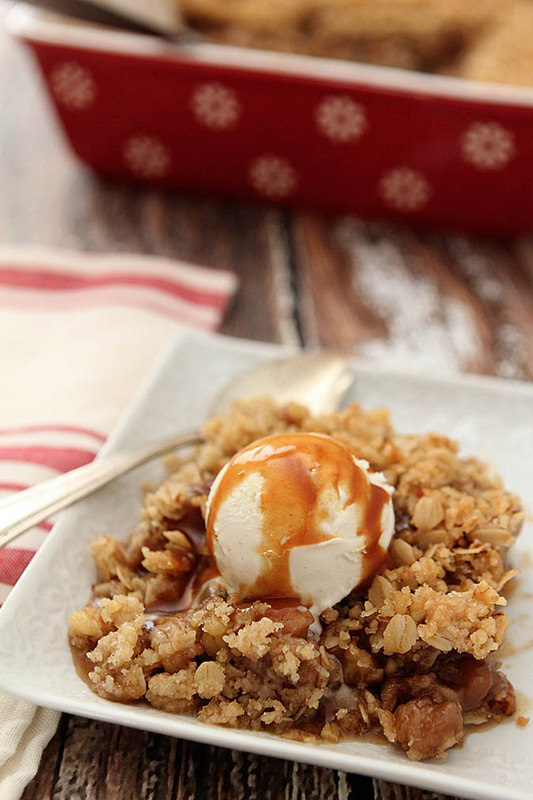 Apple crisp is a favorite treat when the weather starts to cool. 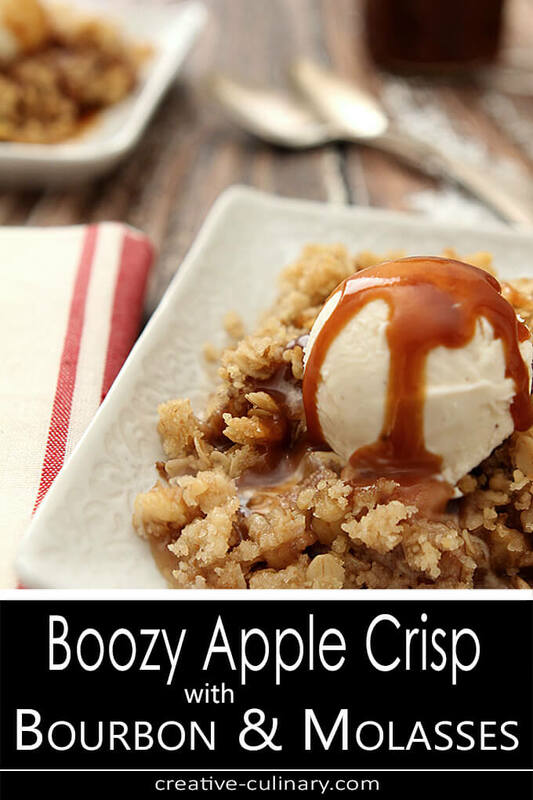 Warm yourself even more by adding some bourbon and enjoying this Boozy Apple Crisp with Bourbon and Molasses! I’ve been making a different version of this Boozy Apple Crisp for way more years than I like to count. ‘Pike’s Peak Spiked Apple Crisp’ has been a favorite for a very long time; since my girls were young and we had a lot of apples from a lone apple tree in our yard. When that tree started to bear fruit I could not give away enough apples but I could sure get a lot of folks to come over for Apple Crisp! I like raw apples OK; especially with a dollop of peanut butter on them or in a great apple salad but nothing compares to a fall treat that includes apples, some brown sugar, cinnamon, and in my ever present state of what can I do with all this booze in the house…some bourbon! So I left the ‘old girl’ alone and did a new twist. Bourbon, brown sugar, a hint of molasses and some oatmeal in the topping for a bit more substance and now the old girl has a new bestie. Topped with vanilla ice cream and some Salted Caramel Sauce with Bourbon and this one was a winner. I love them both but if I had to choose? Really? I can’t. The original has a bit more zest and that citrus zing is so good, and this one is definitely richer with both molasses and bourbon but both are favorites. I can’t choose one kid over the other! Boozy Apple Crisp with Bourbon and Molasses truly is divine though and a nice addition to your fall dessert table. I know it’s absolutely sacrilegious for some, but I make apple crisp easy…I don’t peel. Nope; not a peeler. Which means it comes together pretty quick; always nice for a dessert that is easy to prepare except for that time consuming peeling business. I actually have one of those apple peeler slicer things but I quit using it for this; the slices are SO thin that the apples got overdone while waiting for the topping to brown. So I punted and gave myself permission to skip the peeling and just slice away! Not one person had stood up and had a fit, refusing to eat this dessert so it seems to have been a wise decision. Try it, unless of course peeling apples is your jam! Arrange apple slices in greased casserole dish. Sprinkle cinnamon, lemon, bourbon and orange liqueur on top of apples. Drizzle molasses over apples. In a separate bowl, mix sugars, flour, salt and butter with a pastry blender or in a processor until crumbly; add the oatmeal and chopped walnuts and mix thoroughly. Spread mixture over top of apples. Bake uncovered at 350 degrees until apples are tender and top is lightly browned, approximately 1 hour. Serve warm with whipped cream or vanilla ice cream. Drizzle caramel sauce on top. It calls for molasses but you don’t tell us what to do with it! Yikes! It gets drizzled on top of the apples before the topping goes on. I’ve corrected the recipe Amy, thanks for the heads up. A reader tried it and is now enlightened; makes the process a really quick dessert and no waste too! You have to try it without peeling. Yes, you can tell they have peels. But they are so soft and not intrusive and you’ve saved yourself maybe 15 minutes? SO worth it! It does have just a bit extra oomph Kaitie and I think more than normal crumble. All together? Just the best! 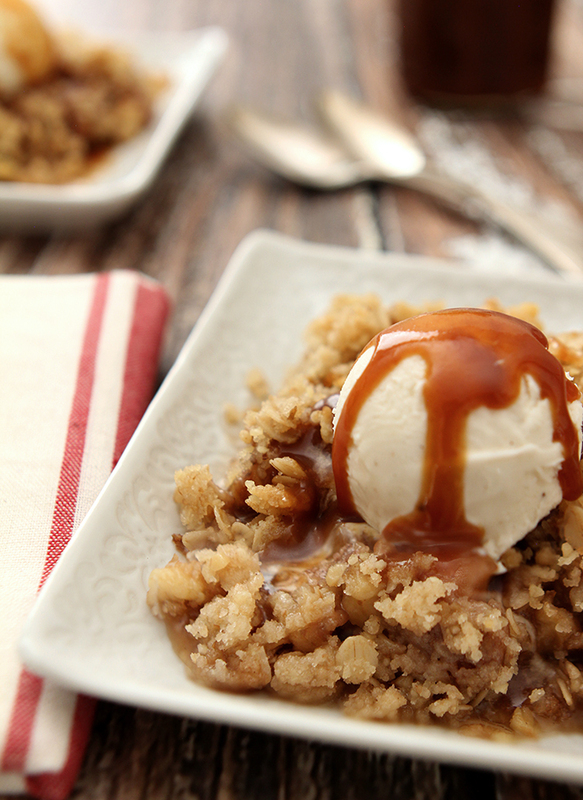 This apple crisp is exactly the type of dish I crave when fall hits. In fact I’m so much in fall mood that I picked up over 6 pounds of apples at the local farm the other day. Plus the addition of bourbon is perfection! It is perfect for fall isn’t it? I’m in the apple mood too; apple crisp, apple butter, thinking apple sangria must happen! The pictures look stunning! If this crisp tastes as good as it looks, i can be making this every week! Makes me wanna run to the kitchen and make this right away. 🙂 I love crisps, crumbles & cobblers! It does Neli. One thing I love? the abundance of the crisp topping; I don’t like searching for crumbles! I adore the fact that you don’t peel the apples in your crisp. I’m not a peeler for crisp, either. Heck, most of the time I don’t peel apples for sauce. I just like the added texture of the peels, and not peeling them keeps all those good vitamins in the peel with the dish. That’s how I justify the time saved anyway. The molasses has got to add so much depth to the flavor. You’re a smart lady all around.